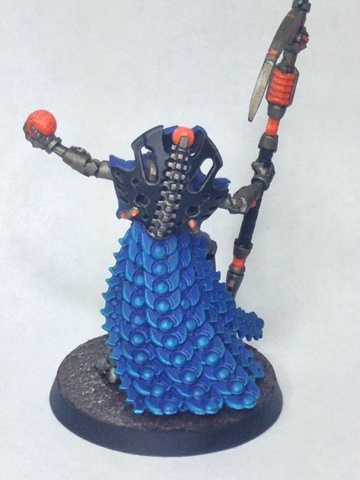 I had already painted a warrior as a test subject and I liked the scheme but I only painted his shoulders in blue. There was a lot more to paint blue on this guy! I also had a lot of glow effect on the warrior and while I do like it, it kind of killed the rest of the scheme so I decided to drop it because of the amount of Orange on this guy. If I had done the glow effect then I may as well have painted the whole model in orange which defeats the point of having a colour scheme! I did add an extra colour to the scheme by adding in some black. 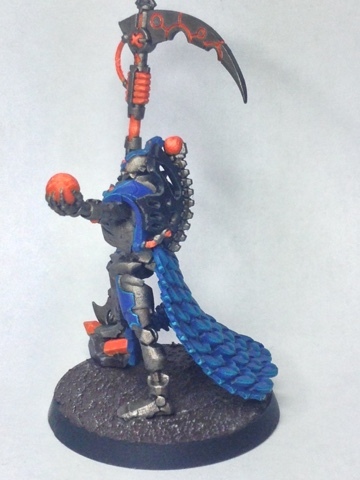 The reason I did this was because the blue and the orange together are a little jarring which is fine in small amounts but in the amounts that there are on this model of both colours it would have been far too much and the silver wasn't dark enough to break it up so I added in a touch of black. It's not a lot but it just enough that the bright colours aren't overbearing. 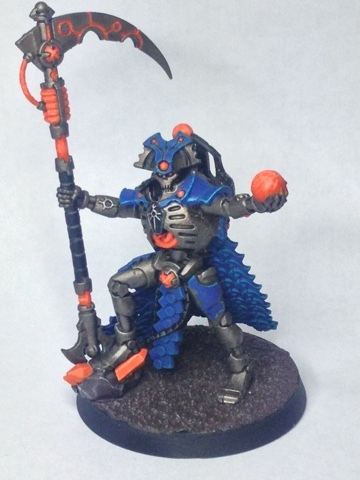 I also deliberately chose a darker colour for the bases of my Necron army so that the bases don't detract from the models themselves but also so that it isn't a riot of colour that is less pleasing to the eye and more assaults it in an almost Slaaneshi manner. That's not what I want for this army so it seems like I'll be walking on a knife edge with the colour scheme. Too much of any colour will saturate the models which is going to be a lot of fun when it comes to the vehicles... Necron vehicles tend to invert their colour schemes so spot colours become main colours. I'm toying with the idea of utilising the colours with a different technique which will keep them looking cohesive but distinctive at the same time. Not sure how I'll do it yet but I have a few ideas that I want to run past my friends who are commission painters to see if I can do it. So that's the start of my new army. 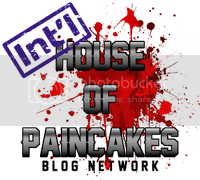 Let me know your thoughts and if you have any suggestions for when I get to the vehicles please don't hold back!!!! This is a fantastic color scheme. 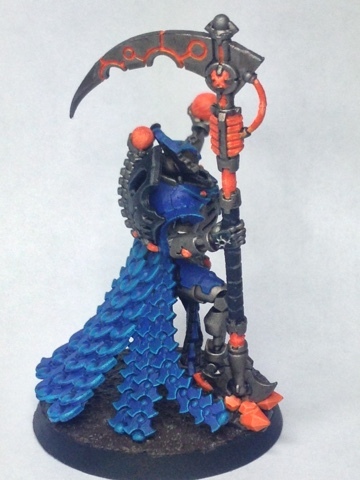 The orange works really well with the blue, and that blue highlighting on the cape is just so brilliant and gorgeous. Did you use yellow as a highlight for the oranges? Actually there's only oranges (which I guess technically means there is some yellow ;) ). I start with Jokaero Orange, then move onto Troll Slayer Orange, then Fire Dragon Bright. I added a final highlight of Lugganoth Orange (the Edge paint) and then finally washed the whole thing with Fuegan Orange. when the wash initially went on it looked like it had blanketed the highlighting and made it one colour again but as it dried the highlights started showing through again. That would explain why it looks so brilliant! Lotta layers! Thanks for the formula!